> > PDF Converter Free VS Pro. "With so many free PDF converters to choose from, AnvSoft's PDFMate PDF Converter stands out in a crowded field by offering a super-easy, wizard-based conversion process in an easy-to-use layout. 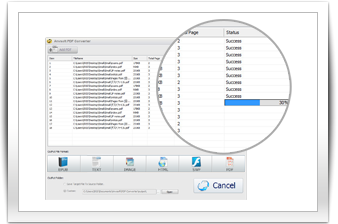 PDFMate bundles six conversion tools in one interface: PDF to EPUB, Text, Image, HTML, SWF, and Word Converters, plus a tool for shrinking multipage PDF documents down to a single page." "Download for my pdf to image and text conversion in really urgent need. It converts so fast that I can finish my report just in time. That really saved me!! Never met a program so simple to use like this, just a few clicks and done. And another important: it's free!" "It can convert pdf's to EPUB, TEXT, Image, PDF (Password protected option). It works, it's free and it's fast. Each file conversion has its own options too. You can also do batch conversions. Really useful program." • PDF to EPUB eBooks. If you want to read a PDF eBook on an eReader app or mobile device such as iPad, iPhone, Sony Reader, or Android phones and tablets, then this Free PDF Converter is the best choice for you. • PDF to editable plain text and Word. What you get is the perfect editable text file and Word file with nice structure. It has good performance in converting multi-column PDF to text. The bulit-in OCR technology makes it possible to convert scanned PDFs to editable files (3-page limit). • PDF to common JPG images, HTML files, SWF and PDF files. With this Free PDF Converter, you can also get JPG/JPEG images from your PDF files, convert PDF files to editable HTML without losing any original layouts, text content, images, and hyperlinks, or convert your PDF to SWF files. Besides, you can restructure the PDF file according to your needs like changing the output size as A3, A4, A5 with 4IN1, 2IN1 layout, even you can add different kinds of password protections to the converted PDF file. 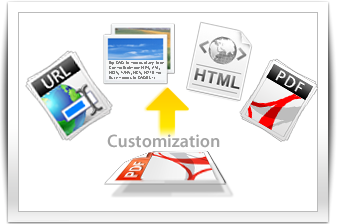 • Convert all content from original PDF files. 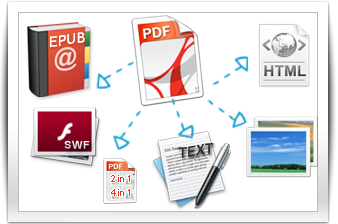 With this Free PDF Converter, you can choose to convert the whole original PDF file to other formats, e.g, extract all content from PDF to EPUB eBooks just the same with the original, convert PDF to sheets of images with all original content included when converting PDF to JPG image, and so on. • Extract specific content from PDF. You can also extract or ignore specific content from the original PDF files: you can extract only images of the original files when converting PDF to JPG, make new content without images, hyperlinks when converting PDF to EPUB e Books, and choose to ignore images, hyperlinks, etc. to get your own HTML from PDFs. • Simple and clear program interface. Easy to use and effective to convert. With the user-friendly program interface, all you need to do is 1-2-3 click: Add PDF > Select conversion type > Click "Convert". Then you can finish converting from PDF to Text documents, EPUB Ebooks, HTML files, etc. like a Pro within seconds. • Built-in Help guide. The program includes easy and clear built-in Help guide, which helps to convert PDF files to your target files within clicks and with perfect quality. • Batch conversion. PDFMate PDF Converter Free allows batch conversion; it processes at high speed and you can convert numerous PDF files to other format of files at one time. • Preserve high quality. not only converts PDF to Text, EPUB eBooks, etc. fast in batches, but also converts PDF files without any original layouts losing. The output files are always super good and preserves original quality of images, text, vector drawings, etc. 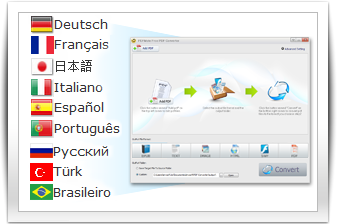 • Convert all languages of PDF files. PDFMate PDF Converter Free supports converting PDF files in all kinds of languages: English, Japanese, Traditional Chinese, Simplified Chinese, Korean, Latin, Turkish, Greek, German, French, Italian, Portuguese, Spanish, Russian, Polish, Czech, Slovak, Ukrainian, Bulgarian, Croatian, Romanian, etc.